According to the CDC, 75 percent of emerging infectious diseases come from animals. Recognizing this, the Delaware General Health District works to protect the public from disease through surveillance, education, and control measures where appropriate. For more information regarding the Health District’s activities to prevent Zoonotic Disease, see the Zoonotic Disease: Surveillance and Control Guide. The safety of the public and our staff is a priority for the Health District. To aid in identification, our Environmental Health inspection staff carry two forms of identification: a photo identification card and a metal badge. We encourage, and our inspecting staff welcome, the public to ask to see both forms of identification to prevent unauthorized access to a building, business or home. No Health District personnel will ever treat an operator, business owner or homeowner differently for asking for identification. Should someone arrive at your location and not be able to produce both forms of identification, please turn them away and call our office immediately. Mosquitoes are a potential carrier of many diseases that affect humans, including Zika Virus, West Nile Virus, and La Crosse Encephalitis. The Delaware General Health District conducts many activities to prevent mosquito-borne disease transmission, including observational community surveys, education/advertisements, larval mosquito surveillance and control, avian surveillance, adult mosquito surveillance and control, and human/animal disease surveillance. Rabies is a very serious disease that affects animals and humans and can result in death if left untreated. Recognizing the dangers associated with rabies, the Delaware General Health District works to protect the public from the threat of rabies. This is performed by monitoring bite/exposure events, investigating exposures, prohibiting wild/exotic animals in the Health District, and requiring residents to vaccinate their pets against rabies. Ticks are carriers of a number of diseases that can affect humans, including Lyme Disease and Rocky Mountain Spotted Fever. 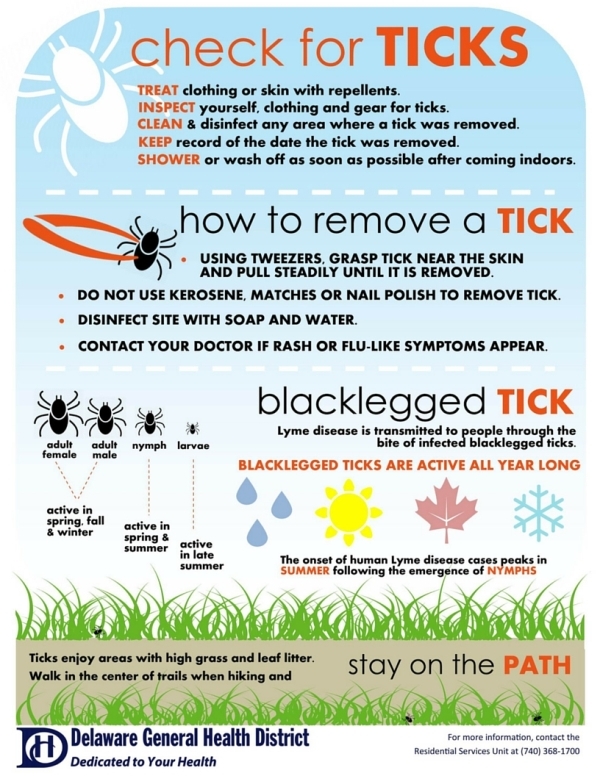 To prevent tick-borne disease, the Delaware General Health District provides education and surveillance and responds to human disease occurrence. To aid residents in protection from ticks, the Health District provides the following advice in the acronym TICKS: Treat clothing or skin with repellants; Inspect yourself, clothing and gear for ticks; Clean and disinfect any area where a tick was removed; Keep record of the date the tick was removed; and Shower or wash off as soon as possible after coming indoors. While a pest, bed bugs have not been shown to spread disease; therefore, the Delaware General Health District does not have regulations regarding bed bugs. However, the Health District believes in providing as many resources as possible to help residents who may have a concern. Staff are trained in prevention, identification, remediation and would be happy to talk about techniques that may help you. If you would like us to help you identify a possible bed bug, please take a picture of it (preferably with a magnifying glass between the lens and the bug), and send the photo to eh@delawarehealth.org. Annually, the Ohio Department of Agriculture performs activities to manage the population of gypsy moths in Ohio. These efforts are aimed at suppressing, slowing and eradicating the moths, depending on the zone. Treatment activities take place in planes flying around 200 feet above the treetops. More information on ODA’s Gypsy Moth program, including treatment areas and approximate dates, can be found here.